Busted Flush Press: CROSSROAD BLUES foreword by Greil Marcus! Occasional musings by the owner of Busted Flush Press, a three-time Edgar Award-nominated crime fiction publisher. BFP proudly produces works by Ace Atkins, Ken Bruen, Reed Farrel Coleman, Bill Fitzhugh, David Handler, Vicki Hendricks, Daniel Judson, Margaret Maron, A. E. Maxwell, Donna Moore, Zoë Sharp, Cynthia Smith, Randy Wayne White, Don Winslow, Daniel Woodrell, and more. CROSSROAD BLUES foreword by Greil Marcus! 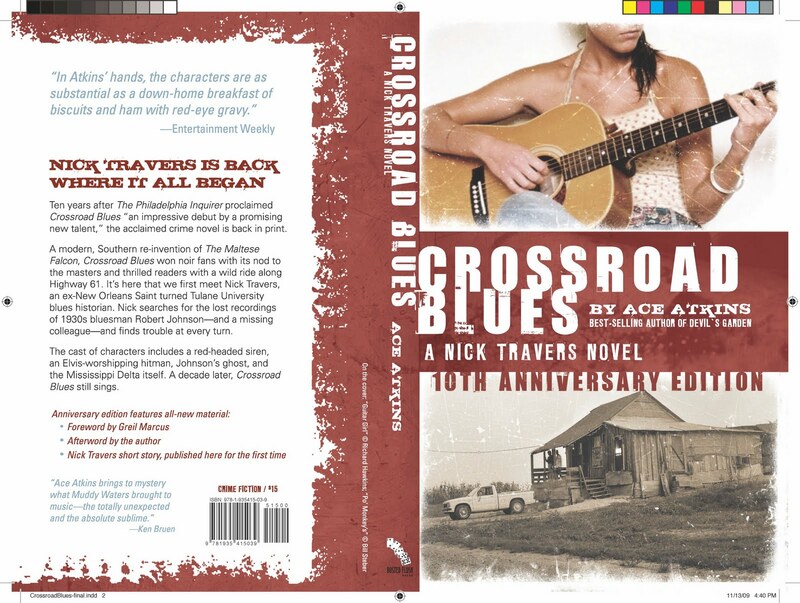 Busted Flush Press's reprint of Ace Atkins's first Nick Travers crime novel, Crossroad Blues (978-1-935415-03-9; paperback; $15) -- which will ship from Consortium to booksellers beginning December 11th -- features not only an original, never-before-published Nick Travers short story ("Last Fair Deal Gone Down"), it also offers the following new foreword by renowned music journalist Greil Marcus. Copyright © Greil Marcus, 2009. Reprinted with permission. You can get as good a sense of Johnson’s presence in present-day life from this barely noticed movie as you can from any number of grander manifestations: his first-team 1986 entry into the Rock and Roll Hall of Fame; the 1990 release of his Complete Recordings, and the subsequent Grammy and gold-record awards; his 1994 stamp. There are novels, from Walter Mosley’s perfect-pitch RL’s Dream, his best, to Sherman Alexie’s pseudo-ghost story Reservation Blues, both from 1995. There are films, from Walter Hill’s puerile 1986 fiction Crossroads to Peter Meyer’s stunningly delicate 1997 documentary Can’t You Hear the Wind Howl? More than seventy years after his murder in 1938, Johnson persists as the most famous and influential blues musician who ever lived. He is a man whose personal culture, his version of a local Mississippi culture—certain moves on six guitar strings, certain recastings of long-polished song fragments, certain inflections of common vocal patterns—has become world culture. Since his twenty-nine 1936 and 1937 recordings began to travel by way of reissue albums and rock ’n’ roll cover versions in the ’60s—the Rolling Stones’ “Love in Vain” and “Stop Breaking Down,” Cream’s “Crossroads” and “Four Until Late,” scores more—Johnson has pressed his case, and his case is an argument against life. Life insures that we will desire what we can’t have; life allows some of us to translate our frustration over our inability to live as we wish into art, and art is only a further trap. Its beauty finally does no more than mock the meaningless existence of those who make it, producing only a greater despair—and that, Johnson said in “Cross Road Blues,” “If I Had Possession Over Judgment Day,” and “Stones in My Passway,” is a cheat. But that’s not all: in Johnson’s hands this argument is an invitation to a dance, a joke, and a mystery. Greil Marcus is the author of The Shape of Things to Come, Mystery Train, Dead Elvis, and other books. He lives in Berkeley. 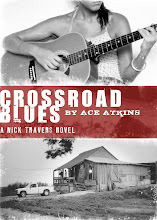 Look for Ace Atkins's Crossroad Blues, out in time for the holidays. The original Nick Travers story, "Last Fair Deal Gone Down," is set at Christmas! Visit Ace Atkins's blog here. Busted Flush Press was formed in 2005 by David Thompson, assistant manager of Houston's Murder By The Book (where he's worked since 1989), one of the nation's oldest & largest mystery bookstores. The original intent of the press was to reprint excellent & important crime fiction, but the press now does original anthologies and novels as well. Visit the press's website here: www.bustedflushpress.com. Busted Flush Press has been named Best Mystery/Crime Fiction Press, Publisher or Imprint by the 2010 Spinetingler Awards! Complete list of winners/nominees here. Mystery Scene's Kate Stine on Busted Flush Press! "[O]ne of my favorite [small presses] is... Busted Flush Press in Texas. Not only do they select high quality books, they do what so many small presses don't: lavish care on the covers and general marketing materials." Read the full article here. BFP in the NEW YORK TIMES! In her rave review of Zoë Sharp's Killer Instinct, Marilyn Stasio calls Busted Flush an "enterprising small press"! Read the full review here. I'm sorry, but at this time, Busted Flush Press is NOT taking any unsolicited submissions. You can find BFP books at your favorite online, chain, and independent bookstores. Scroll down for a list of indie stores that stock our titles, or please ask your local bookseller to carry them. You can also purchase them directly from Busted Flush Press. Busted Flush Press (except for the limited editions) is distributed by Consortium. Go here for a direct link to Consortium's Spring 2010 catalog, which also lists all of BFP's backlist titles. 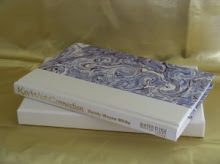 Booksellers can purchase the Randy Wayne White limited editions directly from Busted Flush Press. SHOP FROM AN INDIEBOUND INDEPENDENT BOOKSTORE! And join the Facebook group to help keep independent bookstores around the world thriving. Try an excerpt of Reed Farrel Coleman's first Moe Prager private eye novel, Walking the Perfect Square, and find out why NPR's Maureen Corrigan says, "If life were fair, Coleman would be as celebrated as [George] Pelecanos and [Michael] Connelly.... Reed Farrel Coleman is a terrific writer." News on upcoming BFP releases! Old Dogs (by Donna Moore) should be shipping to stores this week. Pre-order from your favorite bookseller! Next up: Soul Patch and Empty Ever After (by Reed Farrel Coleman). TOWER's leading men make CRIMESPREE cover! Ken Bruen & Reed Farrel Coleman, co-authors of TOWER (BFP's first original novel), grace the front of CRIMESPREE's first sideways cover! It's issue #32 & it's available now from www.crimespreemag.com. Watch for updates on the possible film version of Ken Bruen & Reed Farrel Coleman's TOWER here. Daniel Woodrell interviewed on NPR's "Fresh Air" (06/16/10). Reed Farrel Coleman interviewed at "Signs & Wonders" (02/17/10). Ken Bruen interviewed by Milton C. Toby at ThrillerWriters.org (01/01/10). Megan Abbott (A Hell of a Woman) interviews best-selling thriller writer Robert Crais (The First Rule) in Los Angeles Times Magazine (01/03/10). Zoë Sharp interviewed at MrEdit (12/21/09). YouTube video: Reed Farrel Coleman interviewed by Barbara Peters (The Poisoned Pen bookstore) about Tower (10/16/09). Austin's BookPeople interviews Reed Farrel Coleman (10/14/09). Michael Connelly (9 Dragons) & Reed Farrel Coleman (Tower) interview each other at Murder By The Book (10/01/09). Crime writer Tom Piccirilli (The Cold Spot) interviews Ken Bruen & Reed Farrel Coleman about Tower (08/29/09). Listen to Maureen Corrigan's profile on Reed Farrel Coleman & the Moe Prager mysteries on NPR's Fresh Air (05/14/09). Featuring Cornelia Read's Shamus-winning story, "Hungry Enough, and Daniel Woodrell's Edgar- & Anthony-nominated story, "Uncle." Featuring Bill Crider's award-winning story, "Cranked," as well as Megan Abbott's Anthony-nominated "Policy," which inspired her 2008 Edgar winner, QUEENPIN. The follow-up to the award-winning "geezer noir" anthology, DAMN NEAR DEAD! 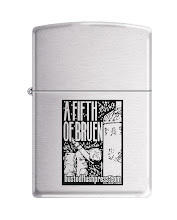 Only 200 of these FIFTH OF BRUEN etched Zippos were created. The perfect gift for any Ken Bruen fan. Named by Time magazine as one of the best suspense novels of the year! Limited edition (limited to 300 copies) of Randy Wayne White's first Doc Ford novel. Signed (by RWW and Ace Atkins, who wrote the intro), numbered, in slipcase. Limited edition (limited to 200 copies) of Randy Wayne White's first "Randy Striker" novel. First time in hardback! Signed, numbered, in slipcase. Support your favorite independent bookstores! Here are a few that stock BFP titles. CROSSROAD BLUES: "Last Fair Deal Gone Down," by Ace Atkins. Nominated for the 2010 Edgar Award. A HELL OF A WOMAN: "Served Cold," by Zoë Sharp. Nominated for the 2009 CWA Short Story Dagger. A HELL OF A WOMAN: "Hungry Enough," by Cornelia Read. Winner of the 2008 Shamus Award. A HELL OF A WOMAN: "Uncle," by Daniel Woodrell. Nominated for the 2008 Edgar & Anthony Awards. A HELL OF A WOMAN: Nominated for the Crimespree Magazine Award for Favorite Anthology of 2007. DAMN NEAR DEAD: "Cranked," by Bill Crider. Winner of the 2007 Derringer Award. Nominated for the Edgar & Anthony Awards. DAMN NEAR DEAD: "Daphne McAndrews & the Smackhead Junkies," by Stuart MacBride. Nominated for the 2007 Derringer Award. DAMN NEAR DEAD: "Policy," by Megan Abbott. Nominated for the 2007 Anthony Award. LISTEN -- Reed Farrel Coleman reads from TOWER, at Crimewav.com. LISTEN -- Reed Farrel Coleman on grief & the intimacy of death, at Behind the Black Mask. LISTEN -- Bill Crider's "Cranked," from DAMN NEAR DEAD, at Crimewav.com. LISTEN -- Jason Starr's "The Last Bachelor of North Miami," from DAMN NEAR DEAD, at Crimewav.com. LISTEN -- Christa Faust's "Cutman," from A HELL OF A WOMAN, at Crimewav.com. LISTEN -- Cornelia Read's Shamus winner, "Hungry Enough," from A HELL OF A WOMAN, at Crimewav.com. LISTEN -- Sarah Weinman's "Blooming," from A HELL OF A WOMAN, at Crimewav.com. WATCH -- Eddie Muller's short film, The Grand Inquisitor, based on his own story from A HELL OF A WOMAN. Bouchercon 2010 -- Oct. 14-17 (San Francisco, CA) Megan Abbott, Ace Atkins, Reed Farrel Coleman, more! NoirCon 2010 -- Nov. 4-7 (Philadelphia, PA) Megan Abbott, Reed Farrel Coleman, Vicki Hendricks, Duane Swierczynski, Daniel Woodrell, more! And the launch of BFP's DAMN NEAR DEAD 2! David Thompson (Busted Flush Press), McKenna Jordan (Murder By The Book), and Jon Jordan (Crimespree Magazine) are co-chairing the Bouchercon World Mystery Convention in St. Louis, Sept. 15-18, 2011. American Guests of Honor: Robert Crais & Charlaine Harris. International Guests of Honor: Colin Cotterill & Val McDermid. Lifetime Achievement Award: Sara Paretsky. Fan Guests of Honor: Kate Stine & Brian Skupin (Mystery Scene Magazine). Toastmater: Ridley Pearson. Register here. Ace Atkins's new deal with Putnam!